Even though the entrance of Spartacus Ransomware is an illegal act, users usually soon realize that they have it active on their systems because they discover the majority of their personal files encrypted completely. As has been observed by specialists, this infection targets the most valuable files belonging to users. These are mainly various formats of pictures and documents, but, of course, users might discover some other files locked either. This ransomware infection has been programmed to lock files on victims’ computers so that cyber criminals behind it would have a chance to extract money from users. 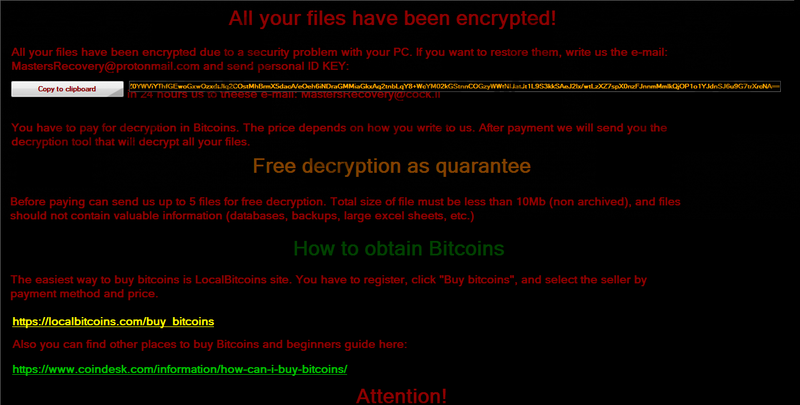 It is hard to say how much money you will need to send to get the decryption tool, but we can assure you that Spartacus Ransomware only wants your Bitcoins. Yes, it might be the only way to unlock encrypted data since ransomware infections use strong ciphers, but it does not mean that you should send money to cyber criminals. Instead of making a payment, you should erase the ransomware infection from your computer so that it could not cause you more problems. It does not drop any additional components, and it works from where it has been launched, so its removal will be quick. To be more specific, you will only need to delete the malicious file launched. The ransomware infection also opens a window that cannot be closed so easily, but you could access another window after pressing Alt+Tab on your keyboard. There is no doubt that Spartacus Ransomware is the one that has infiltrated your computer and locked your files if you see the [MastersRecovery@protonmail.com].Spartacus extension appended to them all (the email address inside the extension might change). After it scans the system, finds users’ files, and locks them completely, the ransomware infection opens a window with a text. To be more specific, it is a message for users. First, they find out why they can no longer access so many files: “All your files have been encrypted due to a security problem with your PC.” Then, they are told that they need to send an email with a unique ID to MastersRecovery@protonmail.com. Do not even bother writing emails to cyber criminals if you know that you will not send them money. They want users’ money in Bitcoin, and they promise to send the decryption tool in exchange right away. Unfortunately, there are no guarantees that you will get the decryptor from cyber criminals, so it would be best that you only send 5 files for the free decryption but do not pay for the full decryption. You might not be able to unlock files without the decryption tool because the only thing you could do is to restore encrypted data from a backup. It is not very likely that you will find a free tool for decrypting your files on the web. There is no doubt that you have not installed Spartacus Ransomware on your computer consciously. Ransomware-type infections enter computers illegally in all the cases, but, unfortunately, users usually help them to enter their computers without realizing that. According to researchers at pcthreat.com, Spartacus Ransomware should be spread via spam emails too. Users might find links inside these emails and allow the ransomware infection to enter their computers with the single click on the malicious link, or they might end up with malicious software by opening a malicious attachment. The entrance of malware is never pleasant, so we highly recommend keeping security software enabled 24/7. Of course, you should take other security measures too. For instance, it would be very smart to stop clicking on suspicious buttons and links. Also, users should never download applications from random websites because they might download malware from them. We have good news and bad news. You could erase Spartacus Ransomware from your system quite easily. You will just need to delete all recently downloaded suspicious files. Unfortunately, you will not unlock a single file by deleting this infection from your computer. Of course, it does not mean that you should let it stay active. If you find the manual removal of this threat complicated, you can clean your system with a powerful antimalware tool. Press Alt+Tab to switch a window. Delete suspicious files from it. Remove all recently downloaded suspicious files as well. Right-click on your Recycle Bin and click Empty Recycle Bin. Quick & tested solution for Spartacus Ransomware removal.